Disclaimer: The following short story, “Death and Resurrection at Winkworth Abbey”, while based on real events in various places and at different times, is entirely fictitious. Any resemblance to actual persons, institutions, or places is purely coincidental. The kindly abbot of Winkworth, one Dom Mansuetus, was much given to consoling his monks at the first sign of sadness, not realising that certain sadnesses are salutary and even necessary if a man is to die to himself and rise in Christ. Abbot Mansuetus feared nothing so much as the sight of monk down in the mouth. He would wear himself out, going from one monk to another, seeking to calm the troubled, placate the irascible, and indulge the whims of the capricious. He thought it his duty, above all else, to keep everyone happy at all times. Although Dom Mansuetus was a pious and learned man, he hated conflict and could not bring himself to correct or rebuke any of his sons for fear of causing them pain and stirring up unpleasantness. For Abbot Mansuetus, the pax benedictina was the absence of unpleasantness. Most of the monks of Winkworth found their abbot’s preference for soft government quite congenial. They were, for the most part, moderately virtuous, moderately observant, moderately diligent, abstinent, and obedient. Abbot Mansuetus moderately congratulated himself on having a community that, apart from one Brother Heraclius, gave him so little trouble. Brother Heraclius, a hugely talented and winsome chap, entered Winkworth Abbey after the community had been twenty years without a novice. Several in the community welcomed him as something of a messiah. Undeniably, Heraclius wielded a certain charm. He was good looking in an Ivy League sort of way, sporty, and bright. He sang tunefully, played the cello reasonably well, and had a vast number of influential contacts in the world. He had a fitful sort of piety and, in the beginning, at least, a convincing veneer of virtue. Since Brother Heraclius’ entrance into the monastery, four or five other men had tried the life, but not one of them persevered. Several of the middle–aged professed monks returned to the world. At thirty–six years of age — simply–professed, but still in the care of the Master of Novices — Brother Heraclius found himself the monastery’s only hope. The next monk senior to him was Father Archibold, and he was nearly seventy. All the other monks were between seventy–four and ninety. The future of the monastery looked very grim indeed. Abbot Mansuetus advised the Master of Novices to be accommodating with Heraclius, to give him little treats, and to spare him the hard and rigorous things of the Rule that seemed to have driven other young men away. “Times have changed”, the abbot would say, “and we must change with them. Our old customs hold no appeal for today’s youth. We must have the courage to let go of the things we once held dear, if we are to survive”. When one or another of the community would question this line of conduct, Abbot Mansuetus would silence their objections by saying, “The Church has asked us to change!” The community were told, and none too subtly, that unless Brother Heraclius was happy, they would lose him and so endanger the very future of the abbey. Three of the senior Fathers spoke among themselves of the state of things and, then, asked for a meeting with Abbot Mansuetus. The abbot was not fond of such meetings. They made him ill for days before and days after, but he could not refuse to meet with the very men who, some twenty years earlier, were, in effect, responsible for his election. These senior Fathers expressed their concerns to the abbot. “Never”, they said, “has a junior monk enjoyed such privileges and had so few ordinary, day–to–day responsibilities”. They told the abbot that it was his duty to call Brother Heraclius to order and to revoke his more egregious privileges. Abbot Mansuetus turned very pale. He began to tremble ever so slightly. This happened more noticeably whenever he was uncomfortable or put on the spot. He looked at the ceiling for a long time, and then he looked at the floor. Saint Benedict’s own words kept pricking his conscience: “He who hath undertaken the government of souls, must prepare himself to render an account of them”. Finally, he heaved a pathetic sigh and said, “Dear Fathers, how can I do what you are asking? It would upset Brother Heraclius to be deprived of the things to which he has grown accustomed. Young Heraclius was not formed in our old observance. He belongs to another generation. We must not upset him, for we have no one else under forty years of age. What if Brother Heraclius should threaten to leave the monastery? It would be the end of us, and our abbey with its long history would have to close its doors”. The discussion became moderately heated. One of the senior Fathers raised his voice. Monks passing in the corridor outside the abbot’s office stopped to listen and, then, appalled by the little bits they heard through the door, scurried away. The discussion went on for one, two, and nearly three hours. The three senior Fathers, although weary and stressed, held to their position. Abbot Mansuetus looked again at the ceiling for a long time, and again he looked at the floor. Finally, he seemed to shrink into a pathetic caricature of himself, and began to weep. “I am at a loss”, he said, “for I cannot ask such hard things of a man, who, in spite of all that you have argued, remains the abbey’s only hope of survival”. One of the Fathers quoted Chapter II of the Holy Rule: “Let him not shut his eyes to the faults of offenders; but as soon as they appear, let him strive with all his might to root them out, remembering the fate of Heli, the priest of Silo”. Abbot Mansuetus paused for a long time, and then said, “If this is to be done, another must do it. I haven’t the strength for any more change. Accept my resignation. I am weary. I have nothing more to give. All I want is peace. I am old. I have grown too soft, and now I am too weak to change. Let me go”. The three senior Fathers didn’t react. Abbot Mansuetus insisted. “Please”, he said, “I cannot go on. I am no longer the man you need”. The Fathers began to feel a little guilty for having stirred up such unpleasantness, but it was too late to take back what had been said. Dom Wilfrid, the eldest of the three Fathers, said, almost under his breath, “The community need to know”. The four monks sat in the kind of silence that fills a room after a dying relation has drawn his last breath. Then, Abbot Mansuetus nodded wearily, but decisively, and said, “Yes, I suppose the community need to know”. The community were summoned to the Chapter Room. Nearly all already knew that something was astir. Long meetings behind closed doors always make monks suspicious. All were present except Brother Heraclius who, providentially, happened to be attending a week–long conference for junior monks. Such conferences were in fashion at the time; the frequency of such meetings seemed to increase in direct proportion to the decrease in the number of junior monks. Dom Wilfrid, the eldest of the three Fathers broke the news to the community. Abbot Mansuetus, frightfully pale and shaking, made a little speech apologising for his pusillanimity, his inability to correct, and his dread of the future. Quoting the Holy Rule, he said, “I am fearful of the coming inquiry which the Shepherd will make into the state of the flock committed to me”. Then he removed his pectoral cross and ring, instructed the Prior, eighty–nine year old Father Simeon to take his place, and begged the community’s leave to go away from the abbey for a year of badly–needed rest. He asked Brother Amadeus, the infirmarian, to give him his arm, and, while the community looked on in shock, slowly made his way from the abbot’s chair to the door. The monks felt rather as one feels at the scene of a motorway accident after the departure of the ambulance. One looks at the wreckage and tries to take it all in. After what seemed a very long time, Dom Wilfrid stood up and addressed the Prior, old Father Simeon: “We hardly know you, dear Father Simeon, for you speak very little. For seventy years you have been the first in choir for Matins and the last to leave choir after Compline. For seventy years we have seen you kneeling in your choir stall every afternoon, or sitting with the open Bible in your lap, or passing the beads through your fingers. For seventy years you have done whatever you were asked to do: the scullery, the sacristy, the library, the orchard, the porter’s lodge, and the guesthouse. When you were named Prior over twenty years ago, nothing really changed except your place in choir and in the refectory. All these years you have been so inconspicuously regular and utterly self–effacing that we hardly noticed you, but today, dear Father, we need you. Will you be our Father?” It was a most untypical expression in the mouth of Dom Wilfrid, for Wilfrid loathed anything that he thought tainted with sentimentality; it could only have come directly from the Holy Spirit. The requisite canonical technicalities were addressed and, by the time that Brother Heraclius returned to Winkworth, the date had been fixed for Father Simeon’s abbatial blessing. His great age would have been an obstacle, but a highly–placed and influential Curial official in Rome, an old friend of Winkworth, secured the necessary dispensations. Astonishingly, Father Simeon appeared taller in his new role. His step was quicker. He resumed daily Chapter talks on the Holy Rule, something that had been suppressed in 1969 in favour of small group sharings. When these fizzled out, nothing replaced them, leaving the community without the daily bread of doctrine and clear direction. Brother Heraclius, unaffected by the new spirit in the house and believing himself untouchable, continued the irregular way of life to which he had grown accustomed. Three weeks passed before Father Simeon called Brother Heraclius to his office. He invited the young monk to kneel on the bare floor next to him, and to pray an Ave Maria. Then Father Simeon sat down and addressed Brother Heraclius. “Dear son, I am going to ask hard things of you. I cannot do otherwise. I pray that you will obey”. Father Simeon then asked Brother Heraclius for his car keys, laptop, and credit card. He gave him one hour to remove all secular clothes from his cell and instructed him to move before the end of the day to an empty cell with nothing more than the most ordinary furnishings. Brother Heraclius was stunned. First he deployed his charm. When that didn’t work, he became enraged. Then began to cry like a spoiled child. He accused Father Simeon of destroying his vocation, of ruining his life, and of failing to understand his needs. Father Simeon looked at him with sympathy, but remained unmoved. Brother Heraclius tried another ploy. “I am this place’s only hope. No one will ever enter here if I leave. I am the only man who stands between you and the nursing home”. Father Simeon said nothing. He waited, and seemed to be praying silently. Then he said, “Very well, dear Brother, write a letter requesting to be dispensed from your triennial vows. I shall convoke the Seniors and proceed with what our Constitutions prescribe in such a case. I shall instruct the Cellarer to provide you with a suitable sum of money for your immediate needs”. Less than forty–eight hours later, Brother Heraclius took the money, and left Winkworth Abbey. He relocated to a major city and, after a few days, found work as a waiter. The monks of Winkworth were shaken by Brother Heraclius’ departure, but inspired by Father Simeon’s quiet confidence and regular observance, even at eighty–nine years of age, they began to restore long–abandoned traditional practices. With quavering voices and uncertain principles of interpretation, they began to sing Vespers from the Antiphonale on Sundays and on certain feasts. The Latin chant had long ago been laid aside in favour of the vernacular compositions of Father Gregory, but it seemed to be rising slowly from some deep living archive in the corporate memory. A handful of monks set about praying the Rosary after Compline to ask the Blessed Virgin Mary for vocations to Winkworth. Father Simeon instituted adoration of the Most Blessed Sacrament for the same intention every Friday. The community persevered in their reformed observance, acknowledging that they could do no more, but intensifying their prayer that God would send them men who could and who would do more. Six months after the departure of Brother Heraclius, five men in their twenties came to Winkworth for a weekend retreat. Of these, three returned for several subsequent visits and, after meeting with Father Simeon, asked to enter the community, undaunted by the more than forty–year gap that separated them from Winkworth’s youngest monk. Father Simeon himself taught them the Holy Rule. Within a year’s time, four other men, friends or acquaintances of the first three, joined them in the noviciate. Then two more men entered. In due time, the original three made solemn profession. Winkworth Abbey woke up after a long winter’s sleep, and this because three old monks, and one old Abbot recognised that certain rebukes are salutary, that certain consolations are detrimental, and that no one need fear “the hard and arduous things by which one goes to God”. 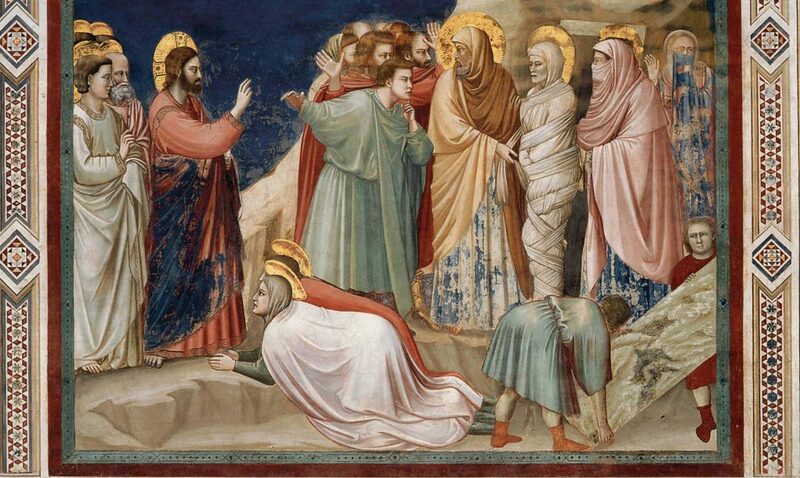 Just as Lazarus was called out of the tomb after four days, so too can an entire community be resurrected to life after forty years, but this is not the end of the story. One morning, Abbot Simeon received an email from Tom Jackson, the former Brother Heraclius. The message was brief: “May I visit the abbey. I need to speak to you”. Abbot Simeon’s reply was even briefer: “Come”. A day later, Tom Jackson appeared at the porter’s lodge, asking to see the abbot. Father Christopher, the porter, who had trouble seeing on the best of days, didn’t recognise the former Brother Heraclius whose appearance and demeanour had, in any case, changed considerably. The man, who appeared to be of uncertain middle–age, was thin and haggard looking. An aura of sadness seemed to hang about him. Father Christopher simply showed him to a parlour. As soon as Abbot Simeon entered the parlour, Jackson threw himself at his feet and launched into the little speech he had prepared. “Father”, he said, “I have sinned against heaven, and before you. I was the bane of this house. I gave scandal and caused disorder. Deceived by the devil, I intimidated and manipulated your predecessor. I threw the precious pearl of my vocation into the mud and trampled on it. In the world, I have been living a very wicked life, but I am not happy. I feel empty. I have dreamed of returning to Winkworth to begin afresh, but I know that you cannot permit such a thing. At least, then, forgive me and send me away with your blessing. Perhaps God will have pity on me and allow me now to serve him in some other way”. It was a Friday. The Most Blessed Sacrament was exposed in the church. Abbot Simeon listened to Jackson; then he seemed recollect himself in prayer for a moment, after which he said. “Go to the church, Tom, and stay there for three hours. I will see you again this afternoon. Have you your rosary?”Jackson shook his head to say no. “Here you are”, said Abbot Simeon. “Use mine” And here is a New Testament. Read Mark 10:17:31″. Three hours later, old Abbot Simeon went to find Jackson in the church. Jackson was there, kneeling in the very back, close to a statue of Saint Thérèse that he had never even noticed during his time at Winkworth. Abbot Simeon sat on the bench next to him, looked at him for a moment, and then, hiding his face in the sleeve of his cowl, said, “Make your confession, Tom”. When the long tale of misery was over and the words of absolution pronounced, Abbot Simeon lifted Jackson to his feet and said, “Come with me”. He led the astonished Jackson out of the church, into the cloister, and up the stairs to an empty cell. “There is a habit hanging on a hook inside. Go in and change, Tom. Leave the clothes you are wearing on the floor outside the door. And be quick. Vespers begin in five minutes and you mustn’t be late to statio. Take the very last place.” The abbot made to leave and then turned back to say, “Oh, there is one more thing. You shall be called Renatus. Brother Renatus”. Deo Gratias, a fine and accurate mythology, in the purest sense. Do you know places where Superiors and Masters/Mistresses of Novices can receive a good ongoing formation? I would be grateful to get helpful information from you on this point. May many monasteries recover in the way you describe.